This month our spotlight review is The Barristers Restaurant at the Courthouse Hotel, Knutsford. Barristers Restaurant and Bar is one of the newest eateries in the busy market town of Knutsford, Cheshire. Owned by the Flat Cap Group, The Courthouse doesn't disappoint on its name or heritage Barristers retain the historic court layout of Knutsford Crown Court remarkably intact. On arrival, you walk into the square, amphitheatre style seating arrangement with diners occupying the vantage points previously held by judge, jury, and legal counsel. The central 'dock' is now the bar, which has some of the comfiest bar stools I have experienced. The room is warm and welcoming, and the decor has a quirky feel, the walls festooned with pictures and mirrors leave the eyes plenty to gawp and chat about. Executive Chef, Steven Tuke heads up the restaurant and promises to provide premium British delights dedicated to a seasonal, fresh and homemade menu that changes with local suppliers, foragers and gatherers lay their hands on. Barristers have vegetarian, vegan and gluten-free options too, so a safe bet for, what can be complicated family meals. Being a Friday evening, we chose off the Dinner Menu, served by an ever so friendly and attentive Sam, to start I opted for the Goats’ cheese mousse served with marinated heritage vine tomatoes, pickled beetroot, compressed cucumber and dill oil. My dining co-conspirator picked the Game Terrine, flavoured with Earl Grey tea served with date compote, apricots, hazelnut crumble, fresh berries and a Ciabatta crisp. Neither starter disappointed, my goats' cheese was whipped and fluffy, light and creamy, and perfectly complemented by the sweet tomatoes, it all would have been too sweet was it not for the stroke of genius of the fresh compressed cucumber which transformed this dish from simple cheese mousse to a symphony in your mouth. 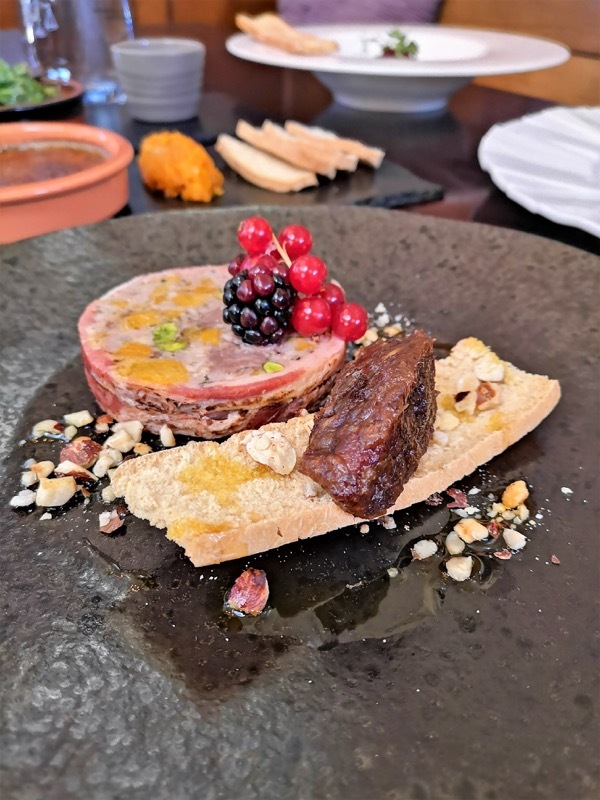 The game terrine arrived, brightly coloured (no grey meat here) bejewelled with bright green pistachios and delicately flavoured with Earl Grey tea, the date compote, sticky and sweet with crisp freshly toasted bread made a perfect little pre-trial. Suitably impressed with our starters, we waited next to no time for our mains to arrive, my slow braised lamb shoulder was served with thyme, and honey roasted pumpkin puree, fondants, creamed potatoes, mint jelly and red currant jus. My lamb was formed into a small meat tower, upon resting my knife on it, fell apart, so tender and succulent. The vegetables were tender but still had structure and bite and the jus and mint cut through the rich lamb flawlessly, my plate was picked clean! My dinner guest plumped for the open lasagne served with creamed wild mushrooms, garlic, leeks and spinach, pine nuts, white truffle oil and parmesan. A deconstructed lasagne appeared, beautifully presented and as tasty as pasta, mushrooms and cheese can be, the sauce velvety and balanced with deep rich mushroom flavours. The dish was just on the verge of having too much truffle for me, but I've always found truffle can be quite polarising, but then again I don't like truffle, my partner in crime, however, did so its an acquittal. While our starters were just enough, the mains were definitely more robust and filling, but there is always room for dessert, so I eyed up the Cheesecake which was served with raspberry ripple, fresh raspberries, raspberry gel and vanilla crumble base. The cheesecake was a baked one, my favourite and was rich but beautifully accompanied by fresh, tart rasberries which balanced the scrummy dessert ideally. My suitably full eating accomplice plumped for the baked apple & brioche pudding, served with toffee crisp, caramel sauce, rum & raisin ice cream. A posh bread and butter pudding, creamy, sweet and marbled with sticky toffee sauce, the boozy rum and raisin ice cream was a guilty treat. I do love, hot and cold elements together in a dessert. The verdict, Barristers provides an excellent selection of seasonally led dishes, which are thoughtful and most with a small twist on what you would consider normality. The service is welcoming and friendly and the surroundings unique. We pass a suspended sentence, giving us the excuse to certainly return for a retrial.